PERVEZ PATEL, a Zoroastrian priest from Elmhurst, Queens, was wearing a long white robe and a white cotton veil over his mouth that looked something like a surgeon’s mask. Using a candle, he set fire to a small pile of sandalwood sticks placed on a dish covered with aluminum foil. Fragrant smoke filled the room, hovering in drifting layers of white under the ceiling lights, as the priest chanted in an ancient language called Avestan. 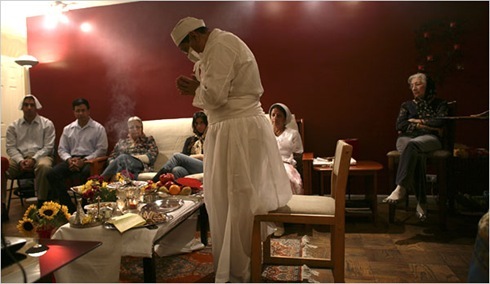 Zoroastrian rituals like these are a few thousand years old and have roots in the land of Persia, now known as Iran. This particular ritual, however, took place on a recent Thursday night in the living room of a two-bedroom apartment near Union Square, and the proceedings unfolded between the flat-screen television set and the white futon. The occasion was a Zoroastrian Jashan ceremony intended in part to bring God’s blessing to Deena Clubwala, a 19-year-old who shares the apartment with a roommate. Ms. Clubwala is an American-born Parsi. The word is a term for Indian Zoroastrians descended from Persians who fled the Middle East a millennium ago. She had recently moved to the city to attend Hunter College, and her parents, who were born on the Indian subcontinent, planned the event to commemorate the start of a new chapter in their daughter’s life. By one count, there are no more than 190,000 Zoroastrians left in the world, and fewer than 1,000 of them are believed to live in the New York metropolitan area. With their numbers few, gatherings like this one are an important way of maintaining their traditions. Ms. Clubwala confessed to being a somewhat begrudging participant in the ritual. “I just get bored,” she whispered while snacking on pasta in the kitchen during a break in the event. The college student spent most of the hourlong ceremony seated cross-legged on the futon, not far from her parents, her grandparents and a few other relatives. For the entire hour, the priest fueled the fire with pieces of sandalwood and pinches of frankincense taken from a silver bowl. As he chanted, a few of those present listened with their eyes shut. After the ritual, the family consumed dal, shrimp biryani and pasta. And despite earlier grumblings, the young woman at the heart of the evening’s event admitted at least some fondness for the ceremony held in her honor.